*Some departments are by appointment only. Consultation Service Hours may vary by department. Please ask the clerk at the reception desk or call +81-466-35-1177 for further details regarding operating hours. *For the first visit patient, please bring your insurance card. *For the returning patient, please bring your insurance card, hospital ID card, and appointment sheet. *New patients without referral letters from another authorized medical insurance institution will be required to pay a “treatment of patient’s choice fee” of 2,000 JPY (+TAX) in addition to the first-time fee. Patients undergoing certain health care procedures that are publicly funded and those transported to the hospital via ambulance are not required to pay this fee. *Please note that we charge ¥20 per 1 medical remuneration point. In an effort to protect patients from contracting viruses, individuals who currently have an ailment or are suspected of an ailment are asked to refrain from visiting admitted patients. We ask for your understanding and cooperation. It is asked that all visitors respect our visitation hours to ensure the safety of everyone in the hospital as well as to provide adequate rest to our patients. Visitation hours may be reduced, limited, or prohibited based on a patient’s condition. We asked that visitation by children under the age of 6 be refrained upon to ensure patients receive proper rest and to protect against possible infection. Visitors are prohibited from eating or drinking in the wards. Visitation by those under the influence is strictly prohibited. Smoking is strictly prohibited on the hospital premises and grounds. A patient’s medical information is only shared with family members or a patient’s medical guardian to protect patient privacy and maintain confidentiality. Please use the main lobby on the first floor or the Day Room area located near the elevators of each floor when visiting patients who share rooms with other patients for extended periods of time to ensure that the other patients may receive proper care and rest. *Visitors experiencing any illness or symptoms of an illness, such as a fever, sore throat, or cough are requested to refrain from visiting patients to maintain a sanitary environment. All visitors must go to the information desk on the first floor and fill out all necessary visitation forms. Obtain the visitor’s pass and have it on your person at all times during your visit. 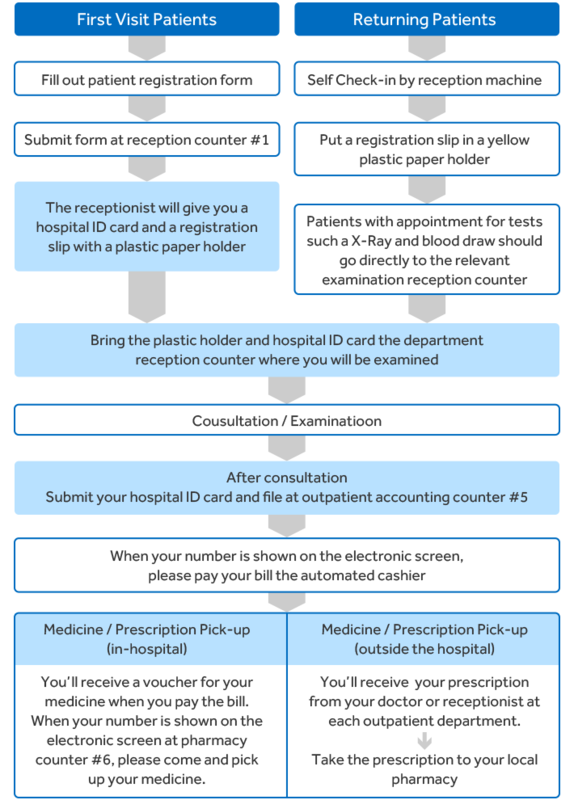 Return the visitor’s pass to the first floor information desk prior to departing the hospital. Persons seen without a visitor’s pass may be stopped and questioned by hospital staff. As of nosocomial infection prevention measures, flowers and plants are NOT permitted in our hospital. Flowers and plants can sometimes carry insects and germs into the environment that may further stress patients’ immune system. In the interest of patient safety, hygiene and comfort, we ask that you do not bring flowers into the hospital in order to provide appropriate care environment to our patients.